Hello my name is Jamii. I own the school Shanti Yoga. The ethos of the school is collecting positive insight into the mind body and soul and sharing it with fellow seekers of light. Focusing on pranayama, meditation, asana and anxiety stress response anchoring. 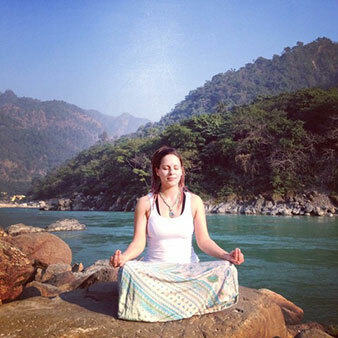 I trained originally as an Ashtanga teachers but have developed my style of teaching by incorporating all the knowledge I have learnt so far on my journey into life lessons to help people maximise their health, immune system and body efficiency through the use of the 8 limbs of yoga, experience and book knowledge. I have been spiritually awake since my teenage years, and teaching forms of dance since early teens and yoga since late 20s. I have taught over 150 classes since December 2016 each and everyone once difference and special in its own way.The Eternal Heart Band is a loose collective of singers and musicians that come together informally to sing and play – around the fire, by the river, in the forest, at spiritual retreats or festivals of sacred music. The group sings chants, mantras, medicine songs, songs for journeying and celebration, as well as music for meditation and healing. Sacred chants from India, medicine songs from the Amazon forest, Zen music from Japan, as well as a fountain of new songs and music received by members of the group.